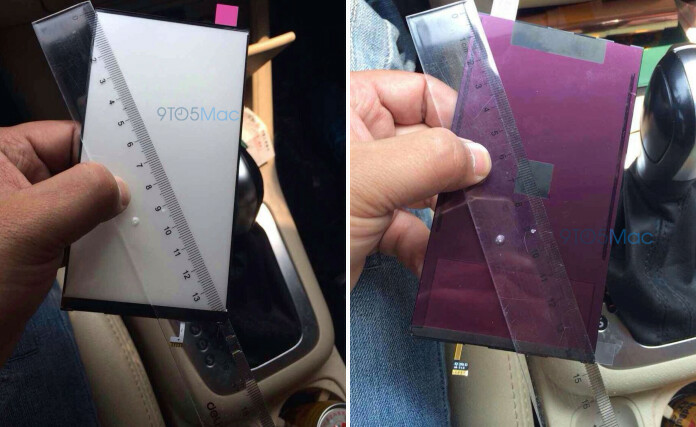 Is this the leaked 5.5 inch screen from the Apple iPhone phablet? An LCD panel, allegedly belonging to the Apple iPhone phablet, has leaked. Measured at 14cm, the actual size works out to a tad over 5.5 inches. Unfortunately, there are no special markings that would prove that this is from the phone that would be the first iOS powered phablet. Keeping a cynical eye on the photo, and taking this with a grain of salt (after all, this could be a screen from anything), speculation has the phablet launching later this year, in short supply. There also has been talk that a larger screened iPhone will employ sapphire glass because of its strength and protective qualities. The 5.5 inch glass is expected to feature a resolution of 960 x 1704. An Apple A8 chip will be under the hood and the handset is believed to support VoLTE. Apple is expected to offer the phablet this year, as a way to fight back against the ever increasing size of Android flagship models. Where once a 4.3 inch display was considered humungous, the Samsung Galaxy W was recently released with a 7 inch screen. New iPod Touch, Not iPhone. They haven't refreshed the iPod Touch since Sept 2013, it's due a refresh. 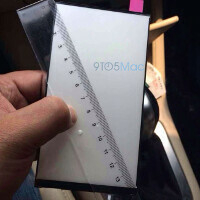 The new iPhone will be 5" only. They say this rumor every year and it turns out to be the ipod touch. Playing the odds its going to happen.. eventually. I am sure this is not the iPhone because the iPhone will feature a quantum dot display. Look at the iOS8 banners from WWDC14 which show the color spectrum in dots. Such displays don't need LED backlight. This is something else, maybe some prototypes or ipod touch. The newest ipod touch was announced on Sept 2012 not 2013. Maybe they just won't make any new ipod touch. They did, but they called it the "iphone 5c". They do a new iPod Touch every 2 years now. The 4th generation iPod Touch was out for 2 years before the 5th generation one was released, so now that the 5th generation one has been out for 2 years, it's time for the iPod Touch 6th generation. Aluminum and half an inch of screen size aside, they really haven't refreshed the iphone either since the 4. Yet the iPhone 5s is the worlds most popular smartphone. I switched to see how it is, and all I can say is that its really a great experience. Proud Android user and very happy iPhone 5s owner. Why fix something that isn't broken? And Justin Beiber sold record breaking numbers of albums. And Jersey Shore was a top rated show for years. The Xbox 360 dominated for years, yet had a 33% failure rate. Beats are the #1 selling headphone brand. Tyler Perry still makes movies. Being popular or #1 seldom means best, or high quality. I can't think of anything that is #1 that is undeniably the best out of all its competition. Most #1 brands rely on heavy advertising, celebrity endorsements and tons of dedicated fans instead of actually making quality products. Exactly. Rolexes, Lamborghinis, and Sennheiser will never outsell Casios, Camry's, and Beats. Not even close. There are more people willing/able to pay for lower end merchandise. Hey man, don't you dare compare Camrys to iPhones. Camrys are great cars. Its the most popular phone in the u.s. Not the world. The world. The most popular smartphone. I agree with you Vexify. Iphones are awesome and I really like the Moto X I have. Some people just seem to have a hard time not having something to hate on. Getting excited about fall. C'mon apple, bring it to the jedster. Me too, can't wait to see you on that pathetic line again spending your kids' scholarship money just for a 5.5.1.0.0001 iDud that does the same thing as a 4S. By the whoooty way, it hasn't been reported on PhoneArena but, Apple, according to my sources, will be removing the 3.5 headset jack and using THUNDERBOLT port for headphone attachment; you will, AGAIN, have to buy an iAdapter to use standard 3.5 headphones on the iPhone 6 .... LOL, you're gonna have to drive a few extra routes down that Vegas strip if you want the next iToy. One of the highlights of my work day is iDrones coming in for adapters. "No, I'm sorry, apple does not allow you to use or read SD cards. They want you to spend $100-$300 for more memory. However, they have a you covered! First you need this goofy $40 adapter, then an SD card will work. Oh you have micro SD? Gotcha covered, $20 adapter. Oh crap, you have the 5/5S? No problem, here's another adapter, that'll be another $32. OK, all together that will be $92 plus tax, please. Why the shocked face?" L.O.L! LOL ...... ! You said iDrones. It's amazes me how a supposedly intelligent and/or educated iConsumer base can be so deVoid of any suststantial brain matter. Apple is making iBillions in adApters. Not removing. Also, it's the lightning port. Plus, the Galaxy S5 is the same as the GSIII. What does it matter to you so much what dark spends his own money on? Get a life dude, and don't concern yourself with what other ppl spend their money on. If someone wants to buy an iPhone, who cares, if they wanna buy an android or WP, who cares, their choice. Also according to your sources? Considering your immaturity and hate/trolling of Apple, I will believe you and your sources like i believe aliens from mars are gonna invade the Earth. Grow up. It's a software screen. Every time it crashes you just reboot it rather than sending it off for repairs.